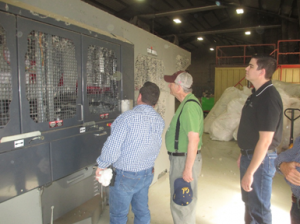 The Association hosted Assemblyman Bill Quirk on a tour of the farm of California Cotton Growers Association Director Cannon Michael of Bowles Farming and with California Cotton Ginners Association Director Mike Davis of Dos Palos Cooperative Gin. Assemblyman Quirk represents the 20th Assembly District which covers the communities of Hayward, Ashland, Castro Valley, Cherryland, Fairview, Fremont, Pleasanton, San Lorenzo, Sunsol and Union City. Assemblyman Quirk is a very active legislator as he is the Chairman of the Public Safety Committee, and also sits on the Agriculture, Appropriations, Revenue and Taxation Committees, as well as the Utilities and Commerce Committee. Accompanying the Assemblyman from the Association was President/CEO Roger Isom and Director of Technical Services Christopher McGlothlin. This is part of the ongoing effort of the Association to reach out to urban legislators to educate and inform them on the critical issues facing the cotton industry. This entry was posted in NEWS & ISSUES on October 28, 2015 by ccgga.